With Father’s Day coming up, I needed to find a place for Sunday lunch to celebrate with my Dad and his wife, Lesley. 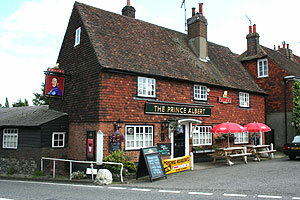 I ran the usual search online, found the Fullers website and narrowed down my search to Prince Albert in Redhill. The link from Fuller’s website doesn’t actually work; I had to hunt for the proper URL through a search engine. The website for Prince Albert is fairly basic (http://www.theprincealbertbletchingley.com/) but as I was looking for a place for lunch and not purchasing something online, I appreciated the fact that they actually had a site in the first place! There were three prerequisites though – 1) that they had a fish course available as Dad and Lesley are pescatarian (they eat fish but not meat), 2) dogs are welcome (as Lesley has a dog, Ella) and 3) that they serve a Sunday roast. No problem with the fish course and I was told they have a specific area where dogs are allowed. Sunday lunches were also offered. So, I booked a table for Father’s Day lunch! The pub was extremely easy to find, being on the corner of the main road through Bletchingley. Outside, the pub seemed unimposing. I tried one door, then realised there is a sign pointing to another as an entrance. We walked through and were greeted straight away. I enquired about our reservation and we were shown directly to a nicely laid out table. We were passed two laminated menus with the main courses. A lady (I believe the landlady Melanie Ketcher) remembered about the pescatarian requirements and reeled off numerous fish courses they can offer, and even a fish platter. I think pescatarians / vegetarians sometimes feel a bit upset when they are not catered for (and quite rightly), this really wasn’t the case here. Both Dad and Lesley decided on the fish platter each, they were even asked if butter was ok! 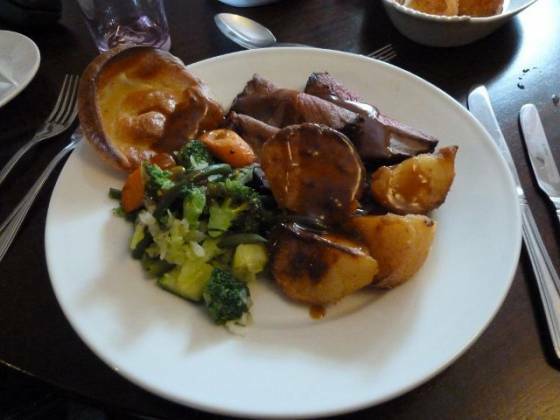 Us omnivores were also covered with Roast Chicken, Roast Pork, Roast Beef and Roast Lamb (“when available”). Claire decided on the roast chicken, I asked for lamb (it wasn’t available ;-)) so settled on the roast beef. The venue inside was quite nice, but very much a village pub affair; for instance, the toilets were basic though clean. We were sitting in the “dogs allowed” area; there was also restaurant section around the other side of the bar. The pub did was clean and tidy. It was a bit cold, even though there was a fair bit of sun outside. It wasn’t very busy inside, no-one else was eating and only a couple of people at the bar. Mind you, this did mean we had the whole area to ourselves! So, on to the food. I have to say, the roast beef was fantastic! Burnt on the outside, succulent and tender in the middle. Probably some of the best beef I have had in quite a while. Claire was happy with her chicken, although once again it wasn’t seasoned (is it unusual to want some rosemary and garlic seasoning with the chicken??). The potatoes were very nice, whilst not completely perfect as they were not very crunchy on the outside, they were nice and fluffy inside. We had so much veg to choose from, the greens included courgette, cabbage, broccoli and green beans; the roasted vegetables included roast parsnips, sweet potato and onions. I expected the fish dishes to have their own side portions, but it was everyone help themselves! This meant we all were able to tuck-in together, especially as the potatoes and Yorkshire pudding were cooked in vegetable oil. I ran out of gravy on the first pour, they brought some more out without any fuss. It took almost two helpings to clear all the food provided, but that didn’t stop me checking out their desserts! 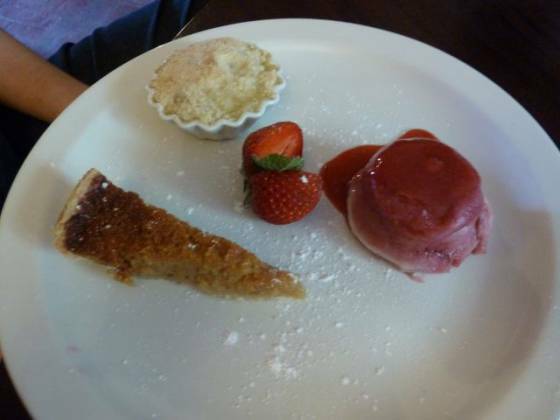 Strawberries and cream, cheesecake, apple crumble, summer pudding and treacle tart (amongst others) were on offer. My grandmother used to make the perfect summer pudding, so I am always wary about choosing this to avoid disappointment. After much deliberation, I couldn’t choose between the crumble, summer pudding and treacle tart so asked some advice. “We can do a trio of desserts, if you wished?” I don’t need to be asked twice! As you can see with the photo below, it was a nice size portion! The summer pudding, whilst not the same as my grandmother’s, was very enjoyable. The fruit sauce complimented the pudding perfectly. My apple crumble and treacle tart were also very nice! All in all, a great Sunday lunch on Father’s Day. They were extremely accommodating with our requirements, very welcoming, fantastic service and the food was excellent quality. If they could sort out the temperature of the pub and improve the (clean but basic) toilets, then they would get 5 plates. 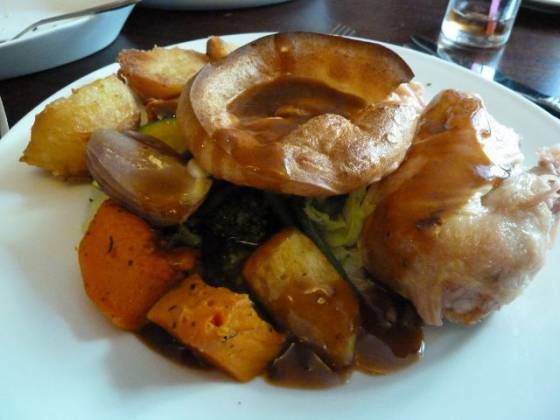 As it is, I can whole-heartedly recommend this pub for a very satisfying family Sunday roast and award 4.5 plates!